Whenever I coach someone on how to begin rowing I typically break it down into three positions starting with the leg drive, then opening the hips and finishing with the arm pull which brings the handle to the lower chest. The movement is very similar to that of the clean, meaning you always start by pushing with the legs, rapidly opening the hips and then bending the arms only after full hip extension. By bringing these parts together we are able to row one full stroke and by doing it efficiently and with correct timing we are able to create much more power and for a very long time. To help us become more efficient, the Concept 2 rower has a handy feature called the “force curve graph” and it is a great way to visually tell how efficient your rowing technique is. It is something I highly recommend viewing during your warm ups and workouts. When looking at the graph the Y axis (vertical line) represents your power output and the X axis (horizontal line) represents time and your goal when rowing is to have a nice “round” line graph representing smooth power output for as long as possible. This also shows that the timing of your leg drive, hip opening and arm pull are correct. On the flip side, the force curve can also help diagnose where your problem area is in any given stroke and what area you need to improve. For example, if your graph has a sudden increase and then drops off quickly it usually means your timing at the “catch” or very start of the stroke is too fast and too much force is being applied with your legs. This often leads to a high heart rate and early fatigue. And then there is the “double mountain” type of curve that gets its name for good reason, it often looks like a steep mountain range with two peaks and typically means that the timing of the legs, hips and arm pull is incorrect. I highly recommend viewing the force curve whenever you warm up so that you can get your technique dialed in before your next workout. Simply hit your “display” button until you get to the “force curve” screen like the one shown to the right. For those who have been rowing for awhile you are probably well aware of what your comfortable or doable pace is for short, medium and long distance rows is. This number is typically located towards the top of the screen and is displayed as either calories per hour or your 500 meter split time depending on what type of rowing you are doing. Your pace can be tracked in real time or as an average with the latter typically being the most valuable during a long distance row. The great thing about the pace boat feature is that it gives you a target to shoot for during your workout in the form of an animated boat that you have to keep up with during your workout. 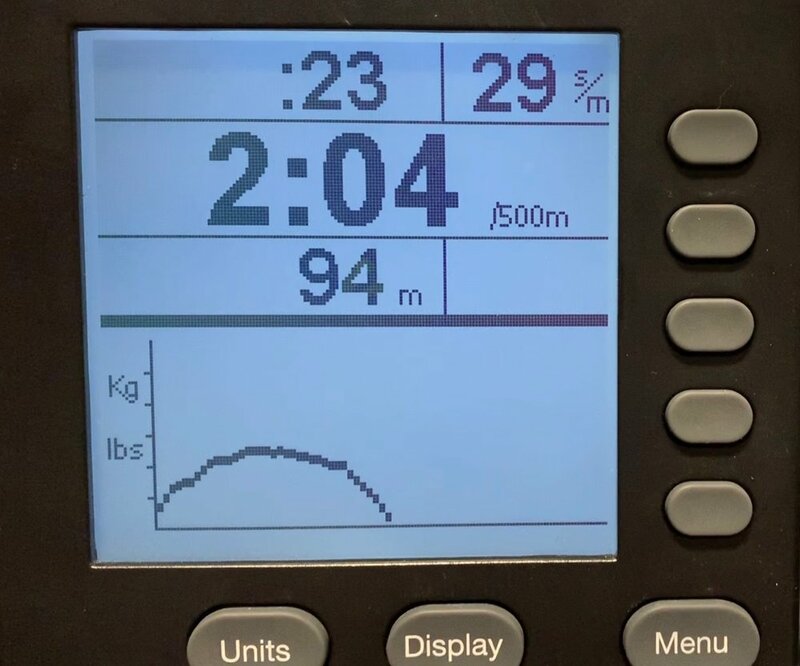 Before you begin your row you simply program the distance that you plan to complete and then enter in your desired pace at the bottom of the screen where it says “pace boat.” Now during your row you will have to maintain or go at a faster pace then the boat otherwise you will fall behind. For those of you that are competitive, it’s a great incentive and more visually appealing than simply looking at numbers on a screen. During most of my 10k and half marathon rows I would row at a slightly faster pace so that I could get ahead of the boat and stop for a drink of water and not fall behind or be able to catch up easier. As you row you should be thinking about driving hard with your legs because this is where most of your power comes from, and as a matter of fact it’s been said by many coaches that you should always think of each rowing stroke as a push, not a pull. This push, or drive of the legs, always begins at the beginning of the rowing stroke and is often called the catch. This is also where you should feel “connected” to the machine which simply means as soon as you begin pushing with your legs there should be immediate tension on the chain but to do this we have to pay attention to our “stroke rate” which is located on the upper right part of your Concept 2 monitor and shown as “s/m”. Those new to rowing tend to get into a bad habit of rowing too fast or having too high of a stroke rate and that often leads to lower or inconsistent power output. This would look like a very shallow curve on the force curve or a sudden spike with a drop off. By slowing the time in between each stroke you can actually generate more power and travel a longer distance for every stroke while also increasing your recovery time and endurance. Next time you row experiment a little and see where you have the best 500 meter time, calories per hour or highest wattage. As an example, if you normally row at 28 strokes per minute, try rowing at 26 strokes per minute while really concentrating on using your legs. Combine this with the force curve and you can easily fine tune your rowing technique to find where you are most efficient. In my opinion one of the most misunderstood and often misused settings on the Concept 2 is the damper setting. This is the sliding adjustment on the side of the round flywheel housing that is numbered from 1 to 10 that controls the amount of air entering the machine. It should not be considered a resistance or intensity adjustment. When rowing, the intensity is always determined by how hard you drive with your legs and how fast you can get that fan spinning inside that housing. To determine where you should have that damper set to depends on the person and the type of workout that you are doing. A person who is proficient at Olympic weightlifting, is a fast sprinter or can lift heavy weight may be more suited to the lower end of the damper setting because of their ability to move quickly, maintain high intensity and have well trained “fast twitch” muscle fibers. On the other hand a person who is more of an endurance athlete and comfortable with longer workouts may be better off towards the top end of the setting because of their well developed “slow twitch” muscle fibers and comfort with lower intensity movements. If you don’t know what kind of athlete you are, sticking with setting number 5 is just fine and works well for most people. So now that we know what the damper setting does and why it’s important, we can accurately adjust it by figuring out our “drag factor” which is a program in the Concept 2 that allows you to pinpoint exactly where your setting should be. This is important because each machine is different and your setting will change depending on what rowing machine you are currently using. To find what “drag factor” works best for you will take a little experimenting and time but once you figure it out your long distance rowing efficiency will greatly improve. There are many theories and workouts out there that attempt to find the correct drag factor, but the one I have used and experimented with a couple times is from Dark Horse rowing and shown in the included video. The workout will take some time but by the end you will have a huge amount of data to help you come up with your correct number. If you are taking part in the 100k challenge you can also review your rowing performance at the end of your workout and even save it by using a USB drive (that you connect before your begin rowing) and by changing your damper each workout you should get a pretty good idea on where you should be. After you have found your ideal drag factor remember it and always set your damper based on that number because every machine is different. These are the biggest things I learned while taking part in the 100k challenge and by experimenting around with the above settings and features I was able to row more efficiently and maintain a consistent pace each time I jumped on the rower. By using the features built into the Concept 2 rower your workouts will become much more effective and you will be able to use the machine to its full potential. There are so many features including games that are designed to improve your rowing technique, and even built in bluetooth so that you can wirelessly link up to four machines and race your friends, which is a blast and something I highly recommend doing at least once. Check out these features and experiment a little but most importantly have fun! Older PostSet Some Goals, and Crush Them!